Welcome to the fourth day of It’s My Party and I’ll Craft if I Want To! In case you're just joining us, Amy (from Ameroonie Designs) and I are celebrating our birthdays all week by sharing projects that we made just for us and some of our favorite things. Monday I shared my dumpling pouch and quilt color choices, Tuesday my favorite everyday things, and yesterday my sewing machine cozy. Today I’m sharing my favorite crafty things. Let's start with fabric. This sounds totally boring, but I love solids. I recently got my hands on a Robert Kaufman Kona Cotton Solids Color Card, and I don't know how I lived this long without it. Pure heaven. 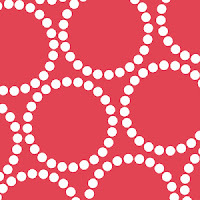 As far as prints, my current favorite is pretty much any shade of Lizzy House Pearl Bracelet. I also have a thing for the Running Stitch print from Patty Young's Lush line. 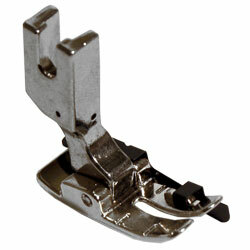 One of my favorite sewing tools is my quarter inch piecing foot for my sewing machine. It has a guide on the right side that helps you sew a nearly perfect 1/4" seam every time. I use it all the time. My bias tape maker is another sewing item I can't do without. I have a 25mm (1"), and this size has worked for every project I've ever needed bias tape for. 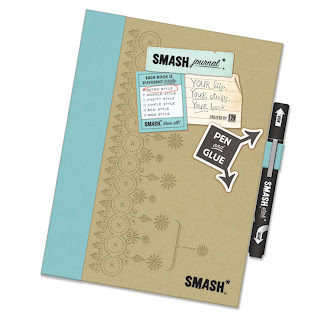 Now for something non-sewing related... Have you heard of SMASH books? I was introduced to them last year when I won one in a giveaway from Malia (of Yesterday on Tuesday). It took me a while to open it up and start using it, but I love it! And my four (almost five!) year old loved it so much that we got her one for Christmas. A SMASH book is kind of like a lazy man's scrapbook. It can be anything you want it to be. It's a pre-embellished journal and comes with a half-pen/half-gluestick attached. Genius! They just started selling SMASH books at Michaels and Target, so keep your eyes open for the books and really cute accessories. I chose the tote bags because they turned out exactly how I pictured them in my head and because of the nostalgic feelings they evoke. I can't tell you how many "when I was little" stories I've heard from people because of these bags. And the quilts because I felt such a sense of accomplishment when I finished them and I got to see my girls curl up under them in the living room all winter long. It was fun to open up my sewing closet and pick out my favorite things to share with you. 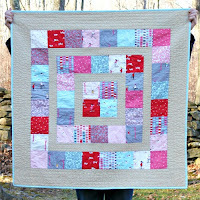 Make sure you click over to Ameroonie Designs to check out Amy's favorite crafty things post today. And come back tomorrow for the birthday week wrap up giveaway. I'm so jealous you guys... You won’t want to miss it! 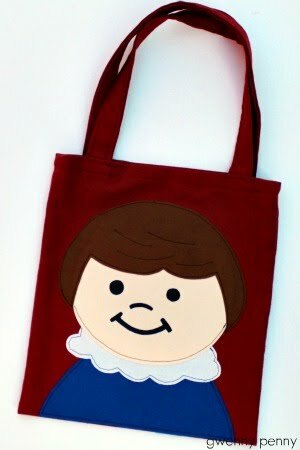 I love those little people tote bags! So much! 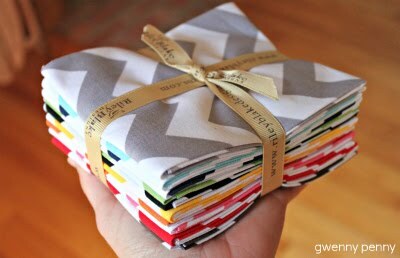 That chevron fabric is so pretty! Question for you....what kind of machine do you use? I would love to get a new one, but not sure what to get; so I am asking around. Ok now I'm going to have to go find a Smash book - I've heard too much about them. I heart those tote bags so ridiculously much! I bet I could afford one of those bias tape makers eh? They really would save a ton of time on so many projects. Your favorites are fantastic. I would have to pick my entire machine because it is my dream machine and has all of the feet and attachments. I can imagine not having a 1/4 foot every again. We have a love affair with smashbooks at this house but my kiddos LOVE them. :)I do the same thing with my art journal. Fabric right now is so fun!! I love your choices. 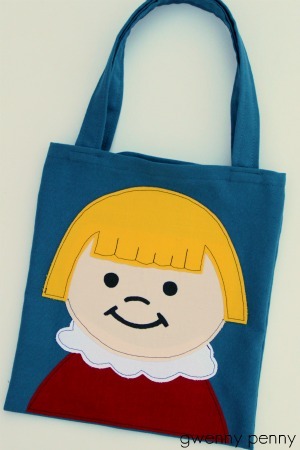 The little people tote bags are incredibly awesome! The memories they brought back were fantastic. Bravo on your creation!